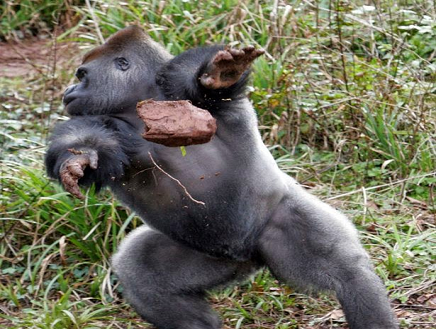 Rock use such as clacking has been described as a way for Sasquatch to signal or communicate with one another, while rock throwing is seen as a territorial display. In addition, chimpanzees have been known to stack rocks as a form of Shrine Ritual. In 2017, rock evidence was collected next to nests high on a ridge in the Olympic National Forest by the Olympic Project. Upon studying the stones further, the rocks showed consistent scarring on paired surfaces, as if the rocks had been repeatedly used for clacking over time. Is it possible that a Sasquatch as a smart ape, is using sound via rock clacking in addition to wood knocks to signal various communications to clan members while hunting or watching over a clan sleeping? The concept is of course observed in many species of primates and mammals and is a known development in communication. Since the 1960s, researchers have recorded a myriad of surprising behaviors from chimpanzees: they use leaves, twigs, stones and spears as tools, sticks as dolls, and throw rocks in displays of dominance. Now, scientists think they may engage in ritual activity similar to our early ancestors. 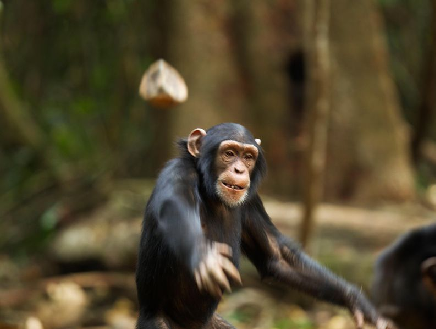 An international team of researchers observed chimpanzees in Guinea, Guinea Bissau, Liberia and Côte d’Ivoire routinely throw stones at certain hollow trees creating rock piles reminiscent of a cairn. A new study published in the journal Nature documents this unusual behavior. Though not definitive evidence of ritual, scientists think that the chimps may be creating shrines under specific "sacred trees," writes co-author of the new study Laura Kehoe for The Conversation. ​“Indigenous West African people have stone collections at 'sacred trees' and such man-made stone collections are commonly observed across the world and look eerily similar to what we have discovered here,” she writes. Kehoe and her colleagues discovered the rock piles after a wildlife guide in Guinea led them to a hollow tree that he thought had been marked by chimps throwing stones. The team set up a camera trap at the site and soon recorded a male chimp approaching the tree, looking around, then tossing a large stone at it. Further investigation revealed many similarly marked trees in the area, some of which had piles of stones in them or at their base. The team contacted other chimpanzee researchers across the continent and soon received many other reports from west Africa about trees with similar marks and stone piles. Chimp researchers further east, however, could not find similar behavior. Rowan Hooper at New Scientist points out that these “sacred trees” fit in with other types of ritual behavior by chimps recorded in recent years, including a dance performed in the rain and a strange ceremony conducted when facing off a bush fire. But Kehoe and other members of the team stress that the ritual aspect is only one potential explanation for the rock tossing. It could also be part territorial display, similar to the drumming adult males do on tree roots, where the acoustics of the hollow tree adds resonance to the rock chucking.